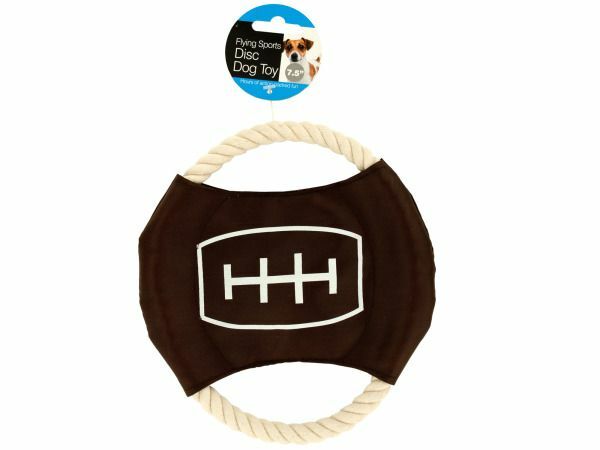 Provide hours of action-packed fun exercise for your dog with this Flying Sports Disc Dog Toy featuring a durable, twisted cotton rope ring with a sports theme nylon center with a squeaker that wraps around the sides of the ring to form a disc. Grab the rope and fling the disc to your dogs delight. Also makes a fun tugging and chewing toy. Measures approximately 7.5 in diameter. Comes in assorted styles. Comes packaged with a hang tag.